Square-shaped chimney brush heads are perfect for cleaning brick and masonry chimneys. This Master Sweep brush head is a square nine inches by nine inches. The toque lock fitting is a universal TLC type connector. The round bristles are a tough and durable oil tempered steel. 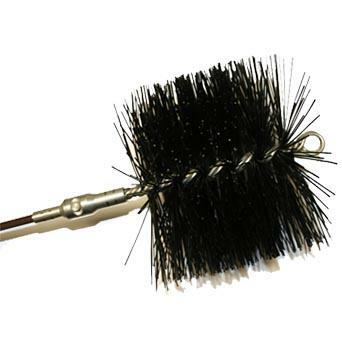 This brush in strong enough to withstand the rugged and constant use of a professional chimney sweeper or cleaner. In fact, professionals have found the brush head to hold up better than other comparably priced brush heads.